Today is the 203 birthday of Napoléon François Charles Joseph Bonaparte, at his birth given the title of the King of Rome, but for most of his short life, since 1818, known as the Duke of Reichstadt. 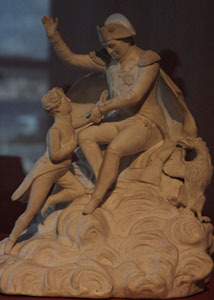 The only son of Napoleon and Marie-Louise Habsburg, and the Emperor's only legitimate child, he lived three happy years in France, adored by his father (he later claimed he remembered that period), but in 1814 he left France and never saw it again, even though formally he had been the emperor Napoleon II for a short time. His birth was announced by 101 cannon fires but he lived most of his life in what effectually was a prison, or a golden cage. By the decision of the Congress of Vienna he remained with his Austrian family, while the French one was kept away from him: he never met any of his numerous uncles, aunts or cousins, because the European powers feared that he could threaten the reactionist peace that had been achieved by the Congress. He left Schoenbrunn only on a small number of occassions, never on his own, and ravelled as far as Pressburg (today's Bratislava, ca. 70 km from Vienna) and Graz (hardly 200 km from Vienna), even though he dreamed of visiting Italy, where his mother lived in her Duchy of Parma, estranged from both her exiled husband and her unhappy son. He received thorough education, even though the main objective of his teachers was to eradicate the French part of his heritage, and despite the fact that for most of his life he refused to learn - to spite the Austrians. He became an avid reader and student once eventually at the age of 20 he was pronounced adult. He neglected his fragile health, and nobody cared enough to look for the true reasons for its deterioration. He died aged 21, lonely in a room full of people, and judging by the documents, convinced that his life had been worthless. And yet all the documents that we possess, which are not numerous and a weird selection (many apparently had been destroyed after his death), give testimony to the phrase that was allegedly coined by one of his doctors: "a soul of iron in a body of crystal". Had he been allowed to ascend the throne, history of 19th century Europe would have for certain been different. But there was no place for his revolutionary brilliant mind in the Europe lulled into conservatism by the Holy Alliance. Gossip that he was poisoned has not died until now. Edmond Rostand's drama L'Aiglon, focused on the last years of his life, is one of the masterpieces of French literature of the turn of the 19th/20th centuries, and the famous Sarah Bernhardt starred in its premiere in the lead role, which became one of the hallmarks of her career. A small number of places in France and Austria are witnesses to his short and sad life. 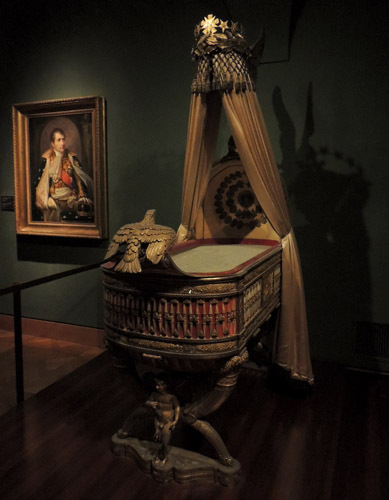 In Vienna one can see his famous cradle designed by Pierre-Paul Prud'hon, kept now in the Kaiserliche Schatzkammer. Only some eight underground stations away from there, in the Schoenbrunn palace, the longer route takes the visitors to the room where he died (and where, by the irony of fates, his father lived in 1809, after the capture of Vienna). Among the morbid memorabilia in Schoenbrunn is the stuffed favourite pet bird of the prince. A lovely selection of items from his happy years in France, and also some memorabilia from the later years can be seen in the Napoleonic museum in the palace of Fontainebleau; in the palace of Compiègne one can see a room where he used to live and a beautiful Egyptian revival clock that belonged to him; also in the Musée Carnavalet in Paris a couple of objects can be found. 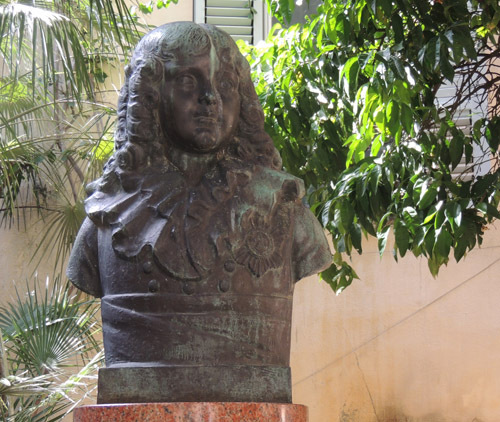 The Louvre possesses a beautiful painting of the little King of Rome, and in Ajaccio in Corsica his only monument stand in front of the hourse where his father had been born. He was originally buried partly in the Capucin crypt in Vienna, with all the Habsburgs, and partly in the cathedral in Vienna, but his remains were brought to Paris in 1940 (noteworthy, though, Rostand's play was forbidden under the Vichy government), and now they repose in the Dome des Invalides, in a side crypt of the main chapel with his father's sarcophagus. Jerôme Bonaparte (1784-1860), Napoleon's youngest brother, was the king of Westphalia in the years 1807-13, and although in later Germany he was known under the slightly disdainful and condescending nickname of "König Lustik" (the Merry King), because of his numerous love affairs and luxurious lifestyle, he was in fact - and despite his young age - a ruler who treated his kingdom and his subject very seriously. Among his achievements, allowed by the introduction of modern constitution (the first in the German states) are the abolition of serfdom and socage, as well as the emancipation of the Jews; under his rule the kingdom (constructed out of a number of small German states, mostly Hessen) lived through a period of cultural prosperity. 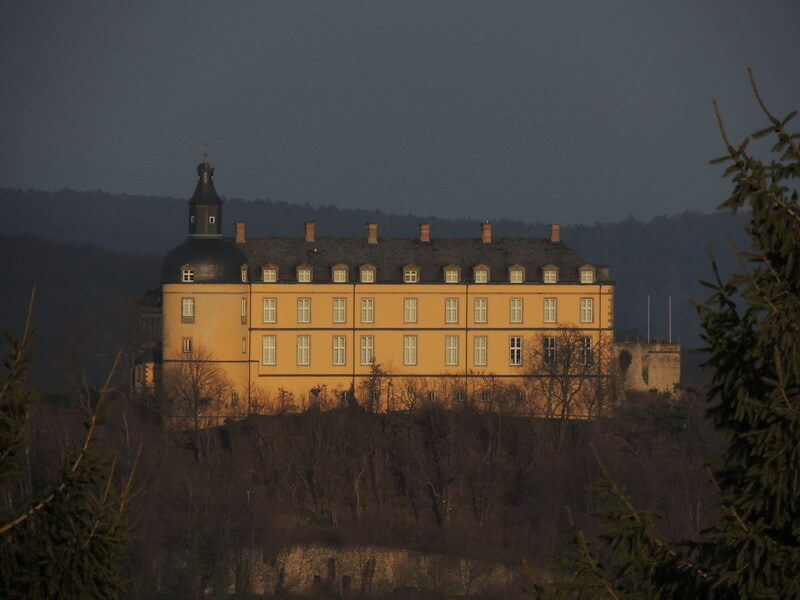 Today's Hessen maybe does not celebrate the short French rule overenthusiastically, but King Jerôme together with his family is present in several local museums, out of which the collection of portraits and memorabilia kept in the Friedrichstein castle near the resort town of Bad Wildungen is the largest. The Schloss, whose history dates to the Middle Ages, but the main architectural shape is mostly 17th century (with the exception of a 16th century tower), hosts the Hunting Quarters and Hessian Military History museum (Militär- und Jagdgeschichtemuseum, being part of the consortium of Museumslandschaft Hessen Kassel), which is focused in the first place on local history (long galleries of portraits of local dukes and commanders; a fine collection of arms and uniforms from the early Modern Age to the end of the 19th century; a small section devoted to hunting traditions - despite the warning about stuffed animals on exposition, there are actually none of these). Five small rooms on the first floor are devoted to the Kingdom of Westphalia, and they are easy to miss, since they are on a lower level, and accessed by relatively narrow stairs going off the equally narrow corridor (some more portraits) at the end of the visit to this floor. The stairs are to the left if you visit the floor clockwise; if you choose the short way, ignoring the gallery of Fürsts, then go to the left on the landing and the stairs will be on your right. 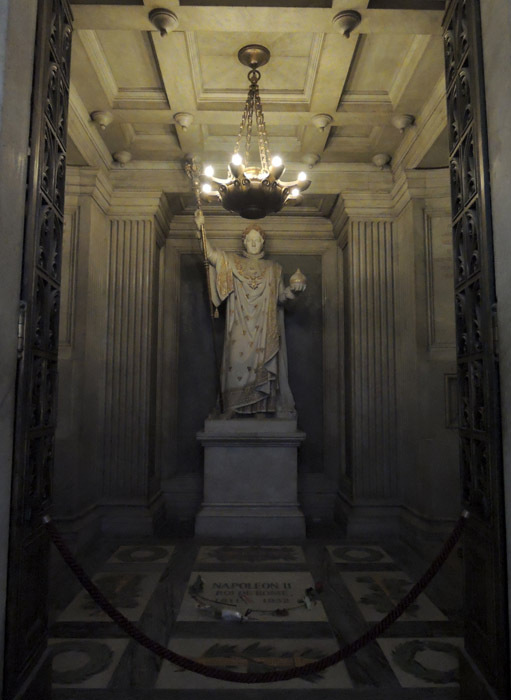 The first in the suite of rooms hosts the statue of Napoleon in the garb of a Roman emperor; the monument was partly destroyed after the kingdom of Westphalia was dismantled by the Congress of Vienna, which adds to its "ancient" look (for instance part of one of the legs is missing, as in so many ancient statues). There are also two famous painted portraits of Jerôme himself: one on horseback and the other in coronation robes. Two showcases contain military memorabilia. 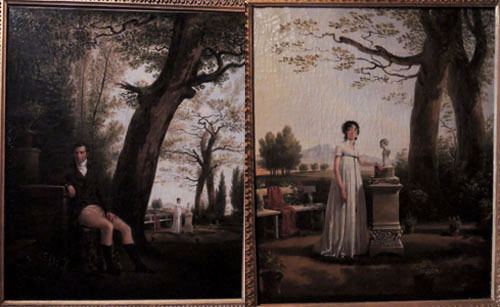 In the remaining rooms, to the left and at the back of the first one, are the portraits of Joseph and Louis Bonaparte, more military memorabilia, including the uniforms designed by Jerôme for the local regiments, biscuit porcelain busts of Jerôme and his second wife, Catherine of Württenberg, her portrait (which is a short course in how not to dress if you could be Rubens' model), and several more paintings and engravings. 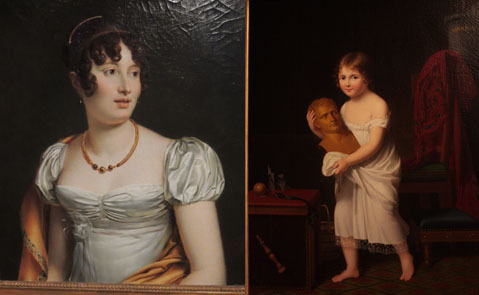 Among the most interesting portraits one shows very young Jerôme with his eldest sister Elisa; the siblings are portrayed with the bust of Napoleon in the background, and Elisa is holding a sheet of paper and a quill to emphasize her intellectual attitude. 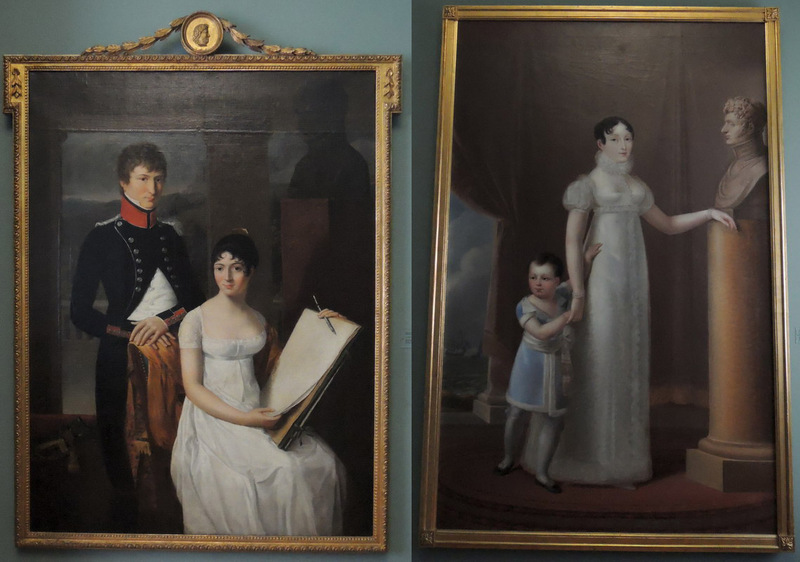 The other painting shows Jerôme's first wife, the American Elizabeth Patterson, with her son, apparently some time after her rather unfortunate arrival to Europe (her marriage was dissolved by the Emperor who had more grandiose plans for his youngest brother). From the courtyard of the castle splendid views over the surrounding Kellerwald-Edersee National Park; the picturesque views of the castle itself can be admired from the hills facing it from the south-east, in the direction of Homberg. The official website gives the times for Tuesday-Sunday 10 a.m. - 5 p.m., but this varies in winter time (dates not specified), when the castle is open only from Friday to Sunday in the same hours. It is also closed on 24, 25 and 31 of December. The shop offers a small selection of books and souvenirs, but it does not accept credit or debit cards. Most of the books, but not the souvenirs, can be purchased in the main museum shop in Kassel where card payments are accepted. Tickets: EUR 3 (concession EUR 2, student concession only for the University of Kassel). Photography is allowed with the fee of EUR 5. The staff will firmly persuade you to follow the direction of visit but they are otherwise nice and friendly. They do not seem to speak any other language but German, though. Easy access from Kassel and motorway Dortmund-Kassel (ca. 35 km, less than one hour leisure drive), greater distance from other motorways (up to 90 km drive on very good but winding and slow local roads). The resort town of Bad Wildungen and nearby communities offer a range of reasonably priced accommodation (from ca. EUR 55 for double room), but restaurants are not numerous and some of them do not open until 6 or 7 p.m. Kaiser Wilhelm on the main street (Brunnenallee) serves some traditional German dishes and plays Heimatmusik mixed with vintage disco hits. 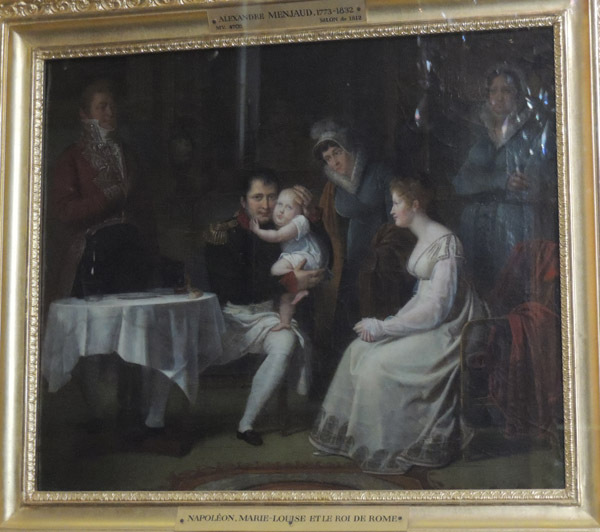 The largest and probably best known museum of arts in Corsica takes its name after Napoleon's maternal uncle, the cardinal Joseph Fesch (1763-1839), whose history with his nephew was turbulent to say the least, but who quite loyally supported the family in general. 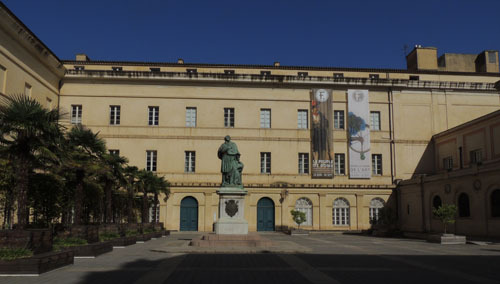 The museum is located in the palace that used to belong to the cardinal, and its main collection consists of pieces of art, mostly paintings, from the cardinal's private collection, which is believed to have been the largest private collection of paintings ever, since it used to comprise ca. 16 thousand paintings and some two thousand other objects of art. 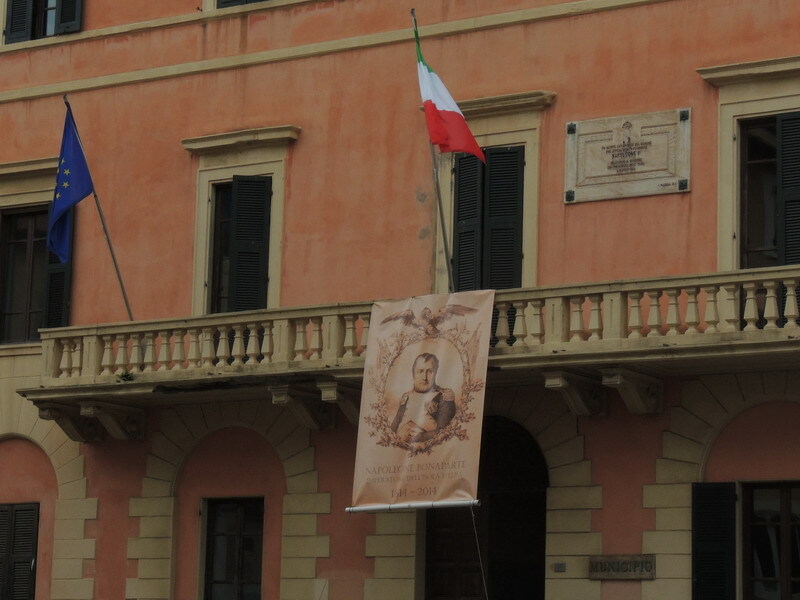 The cardinal wished in his last will for an institute of arts and sciences to be established in Ajaccio, but due to the contestation of the testament only part of this wish was realized in Corsica. The collection of the museum was later enriched by a number of private donations. The paintings on display are in the first place Italian paintings from the late medieval to the 18th century, none of them real masterpieces, strong second league, if anything, despite some big names (e.g. Botticelli, Tizian, Veronese's atelier, Poussin). 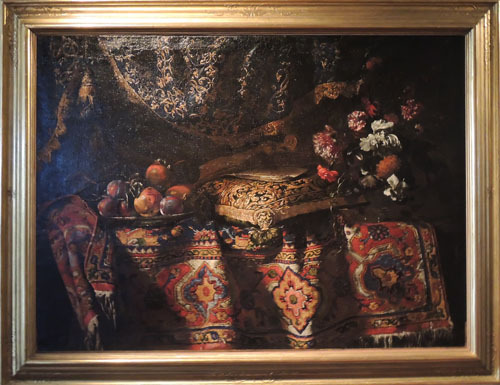 Religious topics dominate, but for me far more interesting was the collection of natures mortes by the 17th century painter Francesco Noletti, known as Il Maltese, featuring unusual fruits and painstakingly rendered oriental fabrics. The extended Fesch collection occupies the first and second floors of the museum, and visitors are advised, or even persuaded to begin the visit from the top floor, but the staff does accept the explanation that one would only go to one part of the museum - like I did upon my second visit. (I mention this because there are museums that make one pass through all the rooms despite any kind of protestations.) Anyway, if you do have time, the main collection is worth at least cursory visit, just as the first floor, which gathers mostly later additions to the collection, including several really nice, if again far from exceptional, late 19th century pieces. 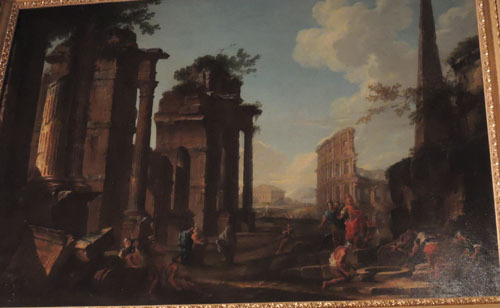 For those interested in curios related to famous people, and famous military people in particular, or in the reception of ancient history, I recommend looking for the mid-18th century Venetian painting with Alexander at the tomb of Achilles by an artist from the circle of Giovanni Paolo Pannini (first floor, main hall, up on the wall). In the basement of the museum there is a nice but hardly breathtaking collection of Corsican paintings, mostly from late 19th century on, including some modern pieces. They show very clearly that second class art was more or less the same everywhere in Europe. The reader of this blog will, however, probably be most interested in the three rooms on the ground floor that host the Napoleonic Collection. The first room offers a really rich array of sculpted portraits (Fesch by Antonio Canova, most by less known sculptors) of assorted members of the family; the larger than life full statue of Jérôme in the ceremonial robes of the king of Westphalia dominates the scene, while other people are represented by Roman style busts. 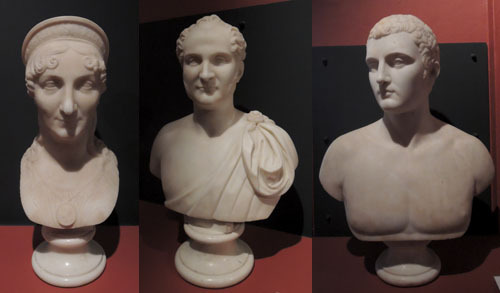 The "Roman style", by the way, does not apply just to the type of sculpted portrait developed in ancient Rome (the bust) but also to details of dress and especially ornaments worn by several of the portrayed. Actually some of the elements have ancient Greek provenance (for instance the characteristic headdresses of the women imitate the Greek stephane worn by goddesses and Hellenistic queens), but were adopted in the official Roman portraiture, and later imitated in the Neo-Classical style of the 1st Empire. The second room boasts one of the famous portraits of Napoleon in the coronation (the Sacre) robes, painted by François Pascal Simon, baron Gérard (usually referred to simply as Gérard). In accordance with the style and fashion every detail is very thoroughly rendered, and the portrait is supposed to emanate majesty and power. Even if he was one of the most gifted painters of his age, Gérard did not have the talent of Jacques-Louis David, but still I personally believe that this is the best of non-David official portraits related to the coronation. I will devote a separate note to the details of this painting one day. There is also a number of other portraits in this room and the next one (e.g. Carlo, Joseph, Lucien, the little Roi de Rome, Félix Baciocchi, Alexandrine de Bleschamp, Cardinal Fesch, Napoleon III, and some others), out of which my favourites are two Gérards that I would count among his best works: Caroline and the iconic Madame Mère, as well as the little Marie-Laetitia Murat carrying the bust of her uncle (author: Jeanne-Elisabeth Chaudet-Husson). As for the latter, I really love the way the paintress captured the smug expression on face of the little girl and I was mesmerized by the display of period children's toys on the left (I remember my parents teaching me to make that origami-like paper horse when I was a child!). Several paintings more loosely related to the historical events, and the rest of the two rooms is dedicated to a variety of memorabilia, among which is the indispensable death mask (I counted 8 of these in Corsica alone, will be possibly returning to their typology on the occasion of Maison Bonaparte) and possibly the single most morbid curio I have seen, at least so far: a miniature coffin, together with its miniature content. Otherwise the display cases contain mostly the typical stuff: figurines (including the always moving apotheosis of the Duke of Reichstadt and a nice Napoleon on a camel), miniature portraits and cameos. 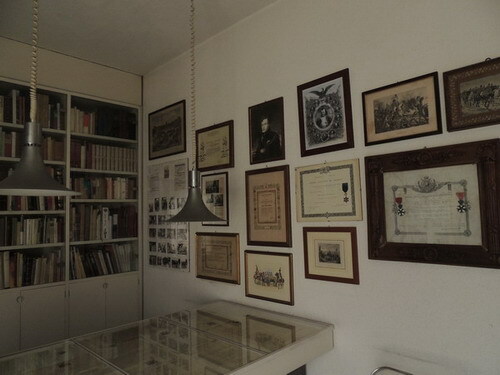 The arrangement of the items may seem a bit exotic at times: for instance the display cases in the second room contain the church paraphernalia that used to belong to cardinal Fesch accompanied by a box with a pornographic image of Marie-Louise and general Neipperg. 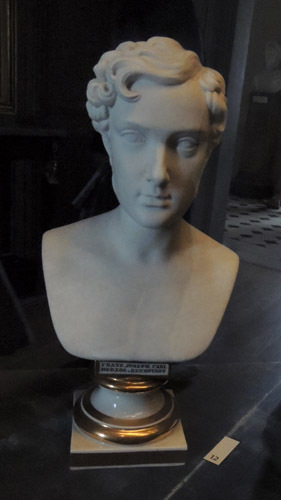 Chronological arrangement does not work, either, since the third room hosts both posthumous memorabilia on Napoleon and the Roi de Rome, and very much lifetime objects of everyday use (e.g. a field nécéssaire that used to belong to Jérôme as the king of Westphalia). All in all it is in the period fashion, since it recalls the atmosphere of the cabinets of curiosities. The museum usually hosts temporary exhibitions, and has a good shop with numerous exhibition catalogues, books, clothes and good taste souvenirs. The large courtyard with the statue of the cardinal makes a good spot for a short rest. To the right from the museum entrance is the Chapelle Impériale, which was built in the time of the 2nd Empire, and where a number of the Bonaparte family members are now buried, but it was closed for renovation in 2013 and no information was given as to when it is due to be open for visitors again. Mon, Wed, Sat 10:30 a.m - 6:00 p.m.
Thu, Sun 12:00 a.m - 6:00 p.m.
Mon, Wed, Sat 10:00 a.m. - 5:00 p.m.
Thu, Fri 12:00 a.m. - 5:00 p.m.
Third Sun of every month 12:00 p.m - 5:00 p.m.
Closed on Tuesdays, and on Christmas; New Year; Nov 1 and 11; Mar 18; Easter; May 1. 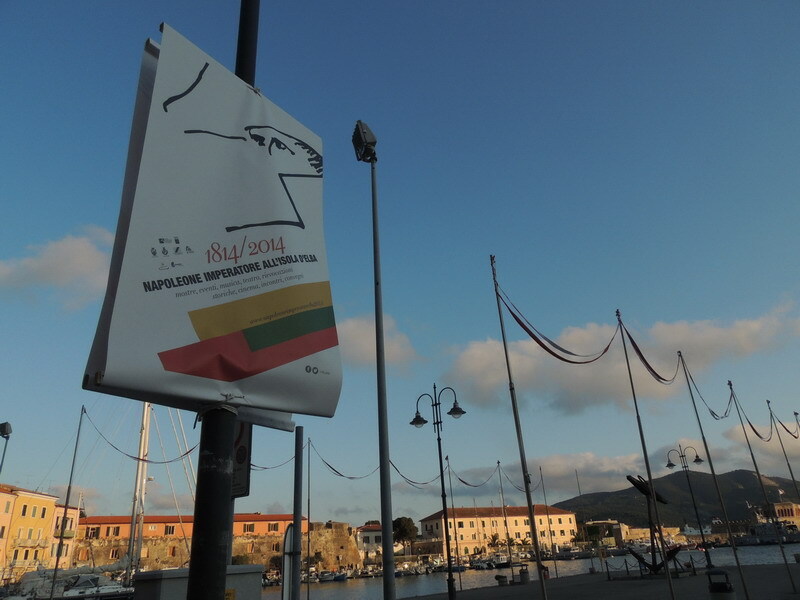 Admission: full EUR 8; reduced EUR 5. Tickets are valid all day, so one can go in and out at will. Personal belongings may be left in the cloakroom for free. 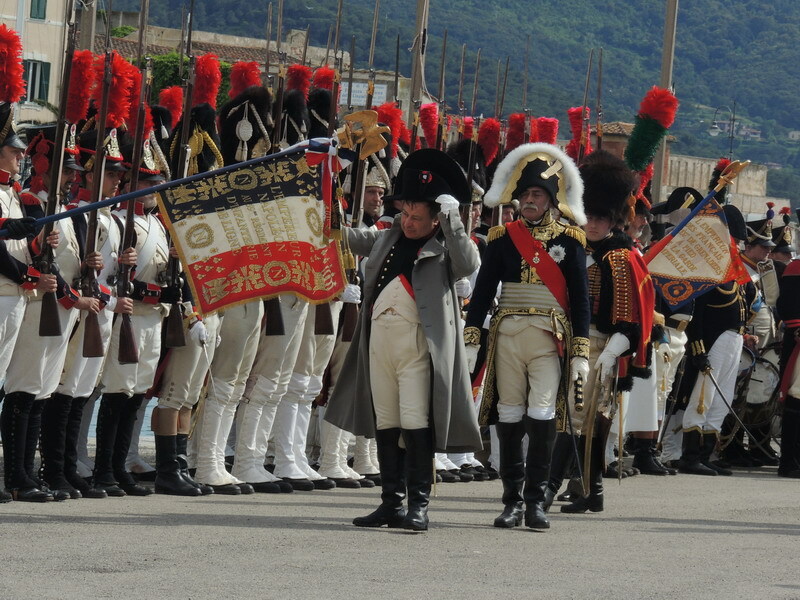 On January 14-15, 1797, the 28 years old general Bonaparte, commander in chief of the First Republic's army in Italy, fought a battle with the Austrians that turned out to be one of the decisive episodes of the north Italian campaign, which eventually ended in October of the same year with the diplomatic success that the peace of Campo Formio was. 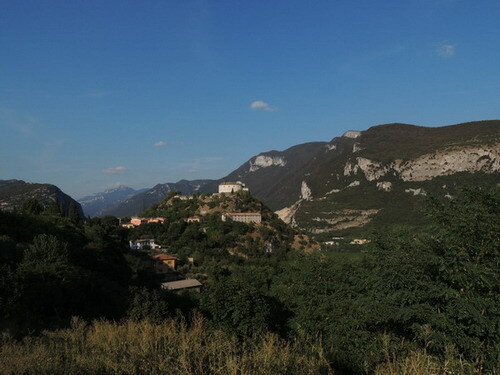 The battlefield comprised the gorges of the neighbouring mountains as well as the plain bordered on the other side by a glacial moraine, and stretched roughly between today's settlements of Rivoli and Cristane. The Austrian forces, which outnumbered the Army of Italy by some 5 thousand men, were commanded by Jozsef Alvinczi, supported by Franz Lusignan and Heinrich of Reuss-Plauen, while on the French side the chief officers included Louis-Alexandre Berthier, André Masséna, Antoine Lasalle, Barthélemy Joubert and others. The tiny town of Rivoli Veronese, situated in a picturesque plain over the Adige and at the foothills of Monte Baldo, may be a little off the road, despite its relative vicinity to the very popular Lago di Garda, but the general guidebooks as well as the official website do not do it justice: with its small museum devoted to the 1797 battle it is a place certainly worth a visit for a period fan, even if it means a detour. The museum is private, and if one believed its own advertisements, it might seem that it hosts just a small number of hardly precious items, probably a map of the battlefield and several memorabilia of the kind that can be found anywhere in a thematic museum. To some extent this is indeed true: many of the engravings may be found in most Napoleonic museums, but Rivoli boasts a truly large collection of relatively rare (even if not unique) pictures and documents, concerning both the battle itself and the Italian campaign, and the period in general. Its collection includes your more or less generic 19th century engravings covering the whole life of the Emperor and a wide range of his generals and family, a large collection of porcelain figurines, day orders and press clippings and several really interesting documents and nice touches such as the listing of headlines in French papers after the escape from Elba. The battle itself is documented by dioramas presenting the terrain and of the distribution of troops, paintings and drawings, but also by finds excavated in the area: flints and bullets, guns, epaulettes and regiment signs (note a fine collection of Austrian items). The period is also represented by small precious items among which the small collection of porcelain with portraits draws attention, as well as a number of medals. 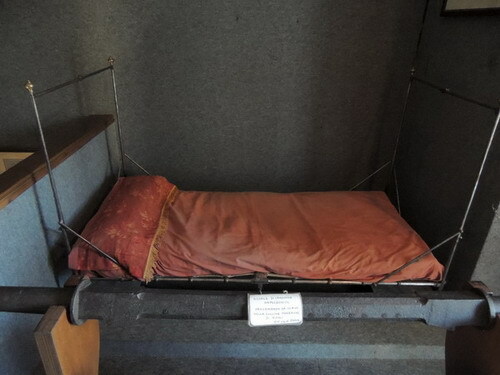 Among the most interesting objects is the actual travel bed of Marie-Louise (dated on the label to ca. 1800 which seems a quite liberal chronology). 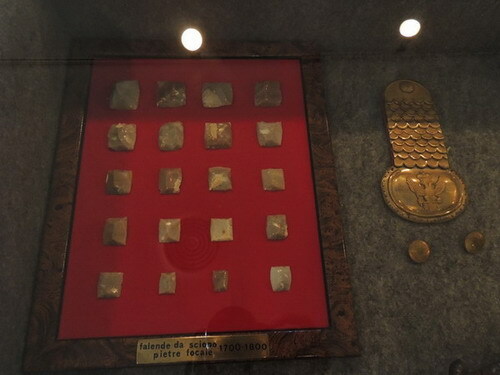 The curios include a small fragment of the golden mantle from the Sacre on one hand and sample of soil from Grotte Napoleone in Ajaccio, sent with an official letter by the Musée Fesch. on the other hand. The main museum is located on the first floor of a small building and consists of one large room divided into sections, where the core of the collection, including battlefield finds is kept, as well as a smaller antechamber (numerous portraits of people involved in Napoleonic wars) and a library, where one wall is covered in shelves lined with impressive collection of topic-related books, while the other walls feature a number of interesting drawings and engravings, and the central showcase presents a collection of documents, partly related to the creation of the museum. On the ground floor a small room hosts a collection of copies of documents related to the Cisalpine Republic. 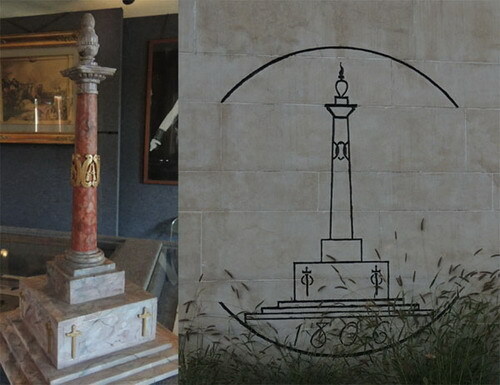 It is worth paying attention to the miniature model of the monument erected in on the battlefield (see below), since the original column was destroyed by the Austrians in 1814 (it is also portrayed on one side of the modern monument). The museum is run by a very nice and helpful man (Italian speaking only, however), who will eagerly open it outside the official opening hours and apparently does not subscribe to the typical Italian (and Greek) tradition of closing the museums and monuments whenever an opportunity presents itself, so one must not worry about a visit even on the holiday of Ferragosto (Aug. 15th, which coincides with the Emperor’s birthday), otherwise truly sacred to the Italians. The enthusiastic attitude is apparently the heritage of the founder of the museum, Luigi Galanti (1897-1989; descendant of Francesco Maria Galanti, who had accompanied Napoleon during his exile in Elba), whose perseverance in collecting memorabilia paid off not only for the man himself (he received the Legion d’Honneur for instance and a number of other commendations) but also for the museum: its collection is being continuously expanded by donations from people all over the world. Souvenirs include a very nice series of the vintage style postcards, a small booklet on the history of the collection and its founder, posters advertising the re-enactments of the battle. You should not forget to sign the visitor book (don’t worry, you will be reminded to do it), since the museum boasts itself of guests from all over the world. 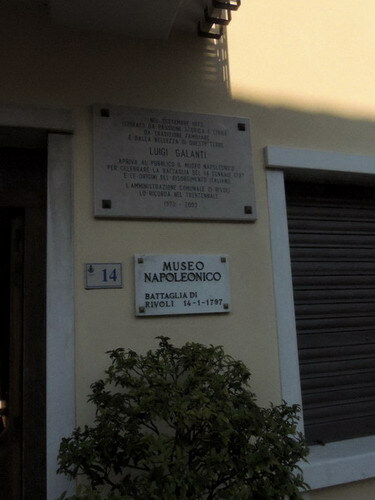 The museum is located centrally in the town, on the stretch of the main road which is called Piazza Napoleone, close to the parish church, and it is hard to miss, but finding other places of interest in the area can be a challenge, partly due to the fact that no map available shows the proper location of the monument (the one that hangs in the museum is completely inaccurate in placing the monument by the fort, while the very detailed one on the board in the town square places it on the wrong side of the motorway), and the house in Affi where the General Bonaparte held his headquarters is not shown on any map at all. 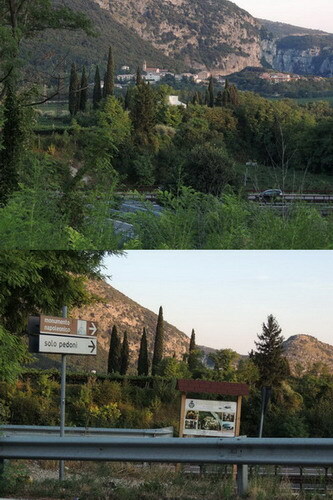 To find the battlefield monument one has to drive on the Strada Provinciale 11 from the museum to the north, past the signs indicating the road to the fort (which is modern but quite picturesque), follow SP11 when it turns right (direction Trento) at a major crossroads in Zuane, and then drive on: after a short series of serpentines going down the sign “monumento napoleonico/solo pedoni” will appear on the right. Access is on foot only and there is little space for leaving the car (no official parking lot), but since hardly anyone stops there I doubt it is ever impossible. Looking down beyond the motorway one can see a small grove of cypresses with a whitish shape in their midst: that is the monument. 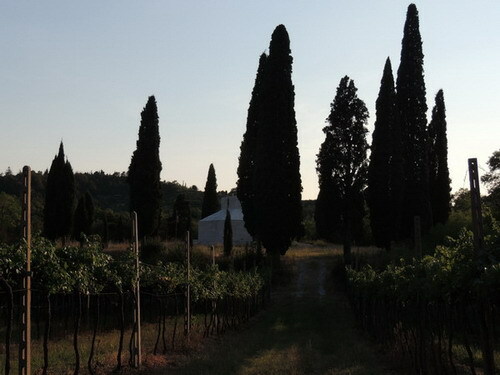 (Actually only once you have spotted the cypresses it becomes obvious that the monument is where it is). To reach the spot one has to go down a comfortable gravel path, which once used to be accessible by car, judging by the remaining signs, and pass beneath the motorway. Just after the bridge there is a path to the left, barred from car access, leading up towards a vineyard. The path is again comfortable, even if rougher than the previous one, and goes up gently. Once up, you simply need to follow it to its natural turn between the grapevine rows (no need to pass under their branches, as it may seem at the first glance). 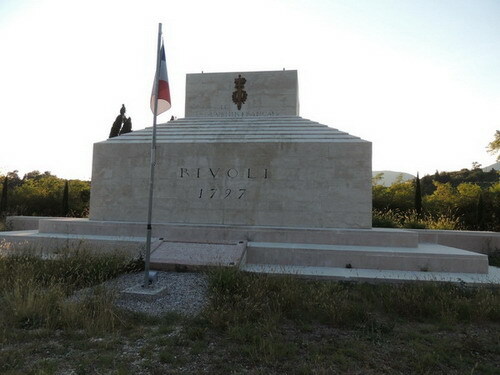 This path leads straight to the monument site, which is encircled by the cypresses and features the reconstructed podium of the original obelisk with inscriptions commemorating the fallen, and a slightly battered French flag on a pole. Behind the podium the remains of the destroyed column can be seen. The site gives a nice view on the surrounding area, but if you want to see the moraine that borders the battlefield it is better to stop on the road just outside Rivoli. 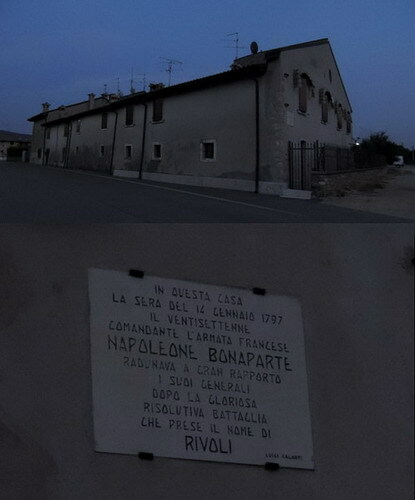 The Cà de’Ri, or Napoleon’s headquarters in today’s Affi, can be reached easily from the roundabout on the outskirts of the town: the street named conveniently Cà de’Ri is right off the small roundabout that connects SP29b and SP9 (on the 29b axis, almost in front of a large shopping area). The house is not accessible to the public, but a board informs us of its historical meaning. 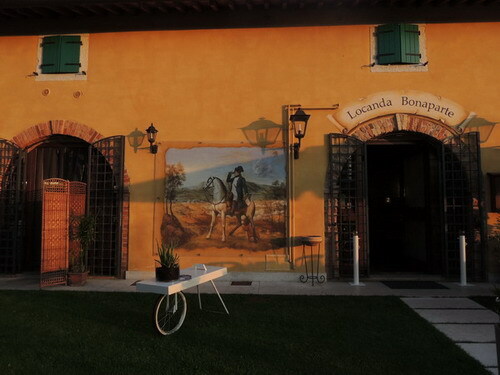 To complement the visit in Rivoli one may drop into the only local restaurant, almost in front of the museum. It is called Bonaparte, and neighbours the Napoleon apartment hotel and serves excellent food at surprisingly affordable prices. Even if you choose to dine outside in the garden, do not miss the inside: it is full of quite interesting items, including very fine collection of porcelain figurines and vintage posters featuring Napoleonic generals. Entry: full EUR 2.50, reduced 1.50. To reach Rivoli by car from the A22 motorway take the Affi exit and continue to Rivoli on SP29b and then SP11 (Rivoli is signalled on the main roundabouts and crossroads from Affi on). If arriving from the Garda on SS450 take the turn in the direction of A22 on the big roundabout and then follow SP29b and SP11 as above. From SP11 turn towards Rivoli on the crossroads (there is a sign for the museum). If arriving from other directions you have to get to SP29b or SP11 and continue past Zuane and turn left to Rivoli when indicated. 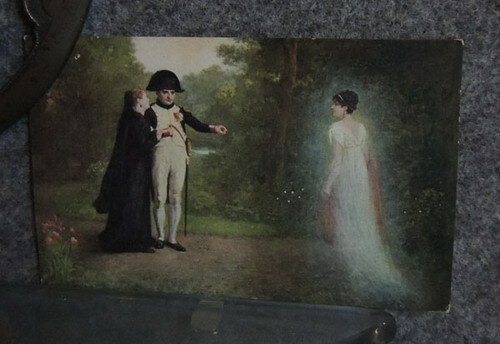 "The postcard you mention is depicting Hortense de Beauharnais and Napoleon visiting Malmaison in 1815 and seeing Josephine’s ghost. Seems an allusion to a well known passage of Hortense’s memoirs. Unfortunately I have no idea about who is the painter." Great thanks, since I am no specialist in Josephine and her family, at least not yet. Guide-blog to fill the gap in the guide-books, based on my travels. I am Classical archaeologist and historian of ancient art, fascinated with the way the Empire period employed the ancient models in arts, politics and propaganda. "'I wished to found a European system, a European code of laws, a European judiciary', wrote Napoleon on St Helena. 'There would be but one people in Europe.' There is some irony in the fact that Waterloo was fought a mere twelve miles from Brussels, the capital of today's European Union. For, although Wellington won the battle, it is Napoleon's dream that is coming true." Texts and photos are copyright by the author of the blog. Picture Window theme. Powered by Blogger.